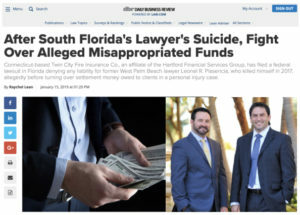 Connecticut-based Twin City Fire Insurance Co., an affiliate of the Hartford Financial Services Group, has filed a federal lawsuit in Florida denying any liability for former West Palm Beach lawyer Leonel R. Plasencia, who killed himself in 2017, allegedly before turning over settlement money owed to clients in a personal injury case. Michael J. Pike and Daniel Lustig of Pike & Lustig in West Palm Beach represent the Cantinellas, and said they disagree with Twin City, but aren’t surprised to see it fighting the payment. In Lustig’s view, it’s disheartening that his clients are still uncompensated for an accident that resulted in 16 surgeries for Michael Cantinella.